Accueil > Articles > HAS KARNATAKA GOT A STABLE GOVERNMENT AT LAST ? From three sources I got the following horoscope of HDK and I decided to look at it. Saturn and Sun in the seventh house and the seventh lord Jupiter with the fourth lord Mercury with Mars in the sixth house is that awful combination which is not going to leave him without torment. 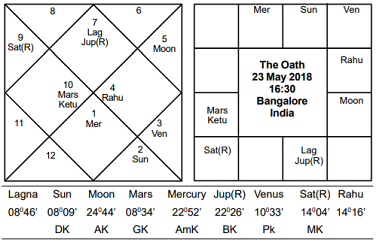 HDK is passing through Mercury Saturn Jupiter, also it is a period of dasha chiddra. 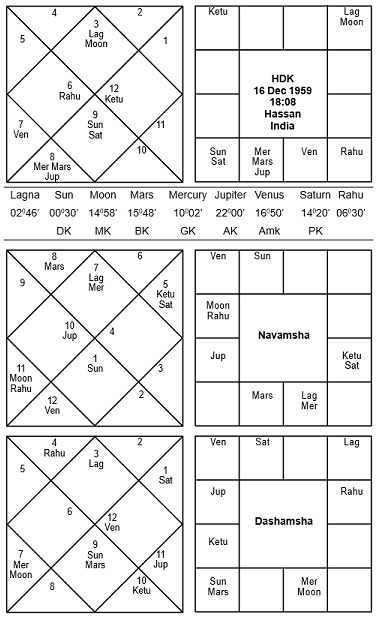 In the period of Kanya Chara dasha Saturn and Sun (PK and DK) aspect the seventh and the tenth house right now after he was sworn as the chief minister. Is the nature of the trouble HDK going to face in his public life clear ? In thedashamansha DK Sun is with explosive Mars in the seventh house. And both of these planets aspect Venus the Amatyakaraka in the tenth house. “Kumaraswamy and his wife Anita are facing charges in the Janthakal mining scam. He is accused of pressuring a senior bureaucrat to renew Janthakal Enterprise's lease of iron ore mining for 40 years on the basis of forged docu¬ments and violating several rules. The bureau¬crat, Ganga Ram Baderiya, was allegedly given kickbacks by Janthakal Enterprise. The owner of Janthakal Enterprises, mining baron Vinod Goel, was arrested in 2015 on charges of forgery. A Special Investigation Team (SIT) is probing this scam on the direction of Supreme Court of India. The above two can be see astrologically in his available horoscope where the fourth lord (Mercury) is with the sixth and seventh lord (Jupiter) and it is also the tenth lord. What needs stressing here is that the fourth lord Mercury is in mrityubhaga showing trouble from land controversies. In the present dasha of HDK the danger of his enemies reviving those cases and pursuing them exist. Will that disturb the entire government or only him and not cause the fall of the goverment can be seen later. Against this see his oath taking chart. The tenth house along with the fourth has malefic predominance. The sixth lord in the lagna aspecting the seventh house is a repetition of the dangers shown in the birth horoscope. Instead of drawing a hasty conclusion, let us see how it all develops. There is every likelihood of the cabinet falling sooner than after the next general of 2019.